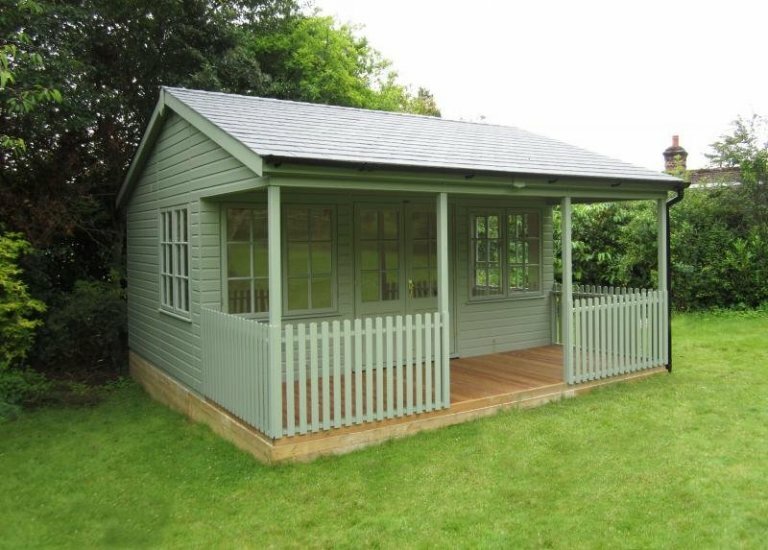 This grand, traditional looking building is our Garden Room with Veranda, and it has been installed in our customer’s garden in Andover, Hampshire to use as an external office/study area, to work in comfort, surrounded by the serenity of his garden. At 5.4 x 4.8m in size, the customer will have plenty of room inside to set it up as a comfortable study, and the sheltered veranda on the front is 1.8m deep (this is part of the 5.4m width), which is a perfect size to sit, relax and admire his garden from. Grey slate effect tiles have been used on the roof for a clean, attractive finish, and the building has been painted in our Valtti paint system, in the colour Lizard to help it blend in with the greens of the garden. 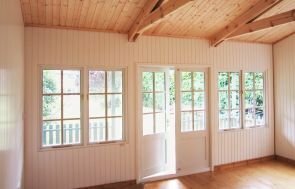 Georgian windows add to the traditional country look of the Garden Room, and they are also all double glazed and can be opened. Internally, there is full insulation, painted matchboard lining on the walls, a Natural lacquer on the floor, a heavy duty floor, and an electrical pack with a heater, so it is fully equipped for year-round use. 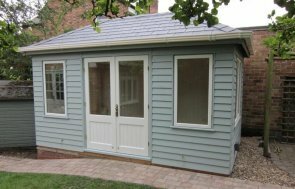 If you want a versatile, yet traditionally styled building that you can use all year round, our Garden Room has everything you could want to allow you to use it so. With a range of sizes, paint colours, roof coverings, and window styles, you can create a building that is suited to your exact tastes. 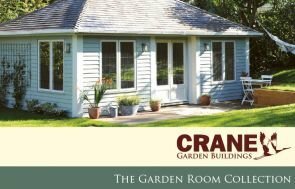 For more information about our Garden Rooms, you can call us on 01760 444229 or send us an online enquiry, and our helpful sales team will be able to talk you through the features of this beautiful building.